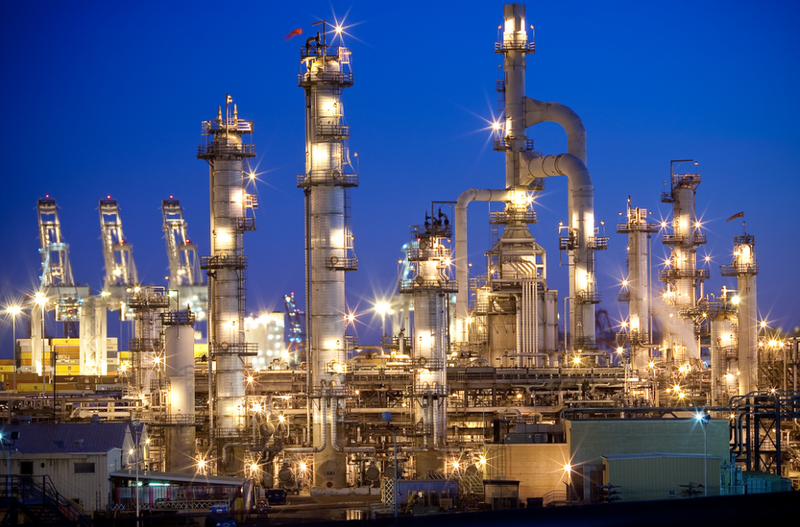 Veteran financial journalist John Dizard noted over the weekend that markets haven't priced in yet a huge, bullish catalyst for U.S.-based refiners. That catalyst is expected to start kicking in in September and peak about a year from now. I explain why I like Phillips 66 among U.S.-based refiners and how to protect yourself in the event Dizard and I are wrong. An oil refinery. Photo via The Fossil Fuel Story. "A Global Trillion-Dollar Transfer Hiding In Plain Sight"
In last weekend's Financial Times, John Dizard offered a compelling case for why U.S.-based oil refiners are poised to cash in over the next year, one that is currently not widely appreciated. More on that in a moment, but first, a word about Dizard, for those unfamiliar with his work. There are ideologues in investing: permabears or permabulls on various asset classes. Dizard isn't one of them. The excerpt below from his Speakerpedia bio is illustrative. John Dizard has been a financial journalist for 34 years. He writes a weekly column for the Financial Times called Street Talk which covers global macro investing, the political economy of currencies, energy, commodities, emerging market debt, the international and domestic credit markets, the automation of securities exchanges, and Iraqi economics and finance. He also writes for The New York Post, The New York Observer, National Review, Fortune Magazine, Institutional Investor, Fortune, Forbes, Barron's, and the New York Journal of Commerce. Previously, he was the London Bureau Chief of Institutional Investor, a correspondent for the Canadian Broadcasting Corporation, and the managing editor of Canadian Business Magazine. Dizard has reported on the postwar Iraqi economy, and on the machinations of Ahmed Chalabi, the controversial Iraqi exile turned politician. He has also reported on coups d'etat in Portugal and Argentina. While at Forbes, he exposed the existence of a secret uranium cartel that fixed prices, and the story led to a successful antitrust suit against the cartel. Dizard has also acted as an advisor to several large individual investors. Namely, Frank Zarb, the head of Lazars Freres' International Department to whom he brought the "Giscard arbitrage" trade in a French government gold backed bond that was described in fictional form in Tom Wolfe's "The Bonfire of the Vanities"; and for the Mocatta Corporation, a division of the oldest gold trading firm. He often appears on CNBC, Fox News, and CBC. He lectures regularly to financial and energy groups on market issues such as the prospects for various currencies and the restructuring of the electricity grid. You would think this supposedly over-arbitraged investment world would have thrown stacks of money at the opportunity (or threat) - but no. This complacency on the part of investors and markets is leading up to a global shock next year. IMO 2020 is not only about ship fuel. Because there will be not enough available low-sulfur marine fuel oil, much if not most of the 3 million barrels of demand will come out of the world's current capacity for "middle distillates". Notably, diesel fuel and jet fuel. There's a tsunami coming for middle distillate prices. [...] The [refining margins] for middle distillates, including diesel fuel and jet flue, could nearly double to IMO 2020. The effect will start around September, and peak around March and April of next year. The simplest approach to getting in front of the "tsunami" Joswick describes would be to buy a basket of refiners, such as the VanEck Vectors Oil Refiners ETF (CRAK). This wouldn't be my first choice because there aren't options traded on it, so you can't hedge it (while its diversification would protect you from stock-specific risk, it wouldn't protect you from industry or market risk). Another approach would be to pick an individual refiner from among its holdings, such as Phillips 66 (PSX), Marathon Petroleum (MPC), or Valero (VLO). Currently, no refiners are ranked especially high by Portfolio Armor, due to their poor recent price performance, but Phillips 66 looks best from an options market sentiment perspective. Because of that, my suggestion is that readers who agree with John Dizard's thesis consider Phillips 66. In the event Dizard and Joswick are wrong about the impact of IMO 2020, and I am wrong about Phillips 66, here's a way you can limit your risk in the stock over the next several months. 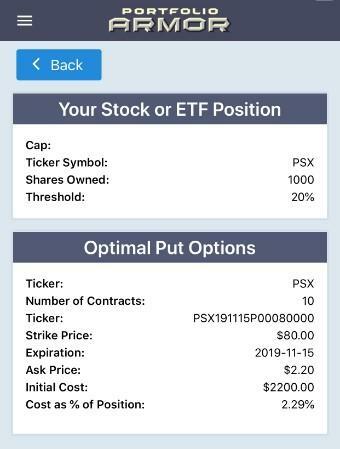 As of Monday's close, these were the optimal, or least expensive, put options to protect 1,000 shares of PSX against a greater-than-20% drop by mid-November. The cost of this protection was $2,200, or 2.29% of position value, calculated conservatively, using the ask price of the puts (in practice, you can often buy and sell options at some point between the bid and ask prices). Wrapping Up: "The Viewpoint Of Calamity"
Some readers may wonder why I posted a hedge after recounting such a bullish thesis for the refining industry. The answer is that I like to think of things "from the viewpoint of calamity," to re-borrow the expression Benjamin Graham borrowed from the rationalist philosopher Baruch Spinoza. If readers decide to buy Phillips 66 based on this article, and the stock does terribly instead, I wouldn't want any of you to suffer an insurmountable loss. With the hedge above, your downside risk would be strictly limited, but your upside would be uncapped.